One of the Earliest Jack Nicholson Roles in The Raven.. The Raven The Masque of Red Death 1963 - 175 min. 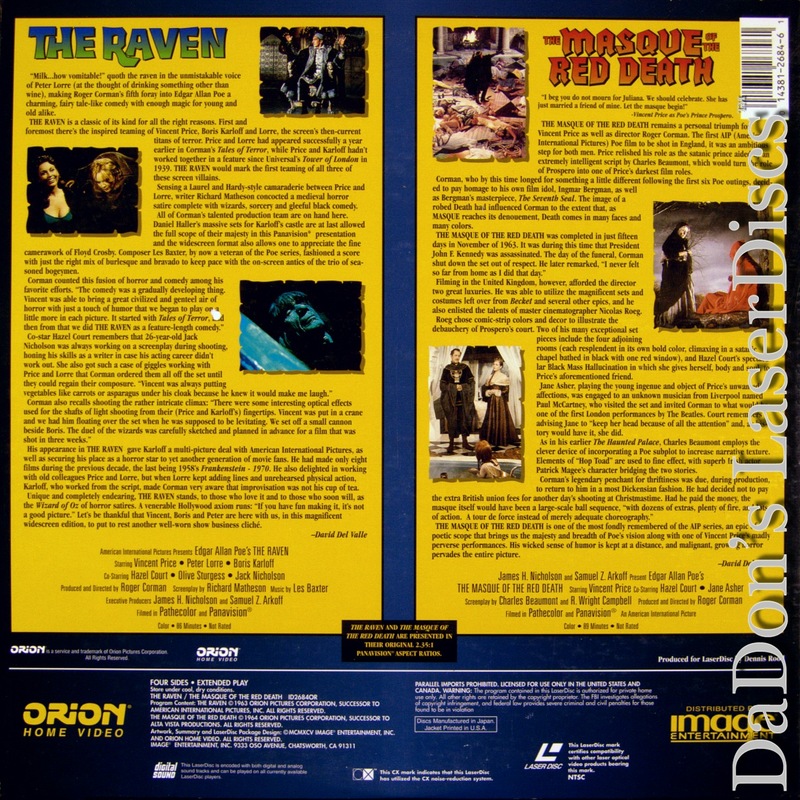 - Color Genre: Horror Not Rated Country: USA LaserDisc Movie Storyline: Not only does this atmospheric AIP horror-comedy feature Boris Karloff, Vincent Price, and Peter Lorre, but it also stars a young Jack Nicholson. Add a funny script by Richard Matheson and deft direction by Roger Corman and this is unbeatable fun, a perfect Halloween film for the whole family. 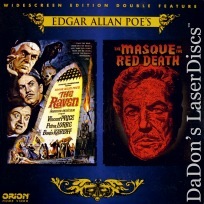 Price stars as Craven, a sensitive, nonpracticing 16th-century wizard who begins the movie alone in his castle, lamenting for the lost Lenore, via the famed Edgar Allan Poe poem. Naturally, he's soon visited by a raven, which in this case turns out to be a wine-swilling, obnoxious fellow magician, Bedlo (Lorre), who's been enchanted by the evil sorcerer down the road, Dr. Scarabus (Karloff). When it's revealed that Craven's presumed-dead wife, Lenore (Hazel Court), was seen at Scarabus's castle, Craven heads over to investigate, along with Bedlo, Bedlo's son (Nicholson), and Craven's attractive daugter, Estelle (Olive Sturges). Once they arrive at Scarabus's gloomy, cobweb-covered abode, a wild night of horror and hilarity ensues, highlighted by a climactic wizard's duel between Scarabus and Craven, replete with colorful special effects and great comic timing. 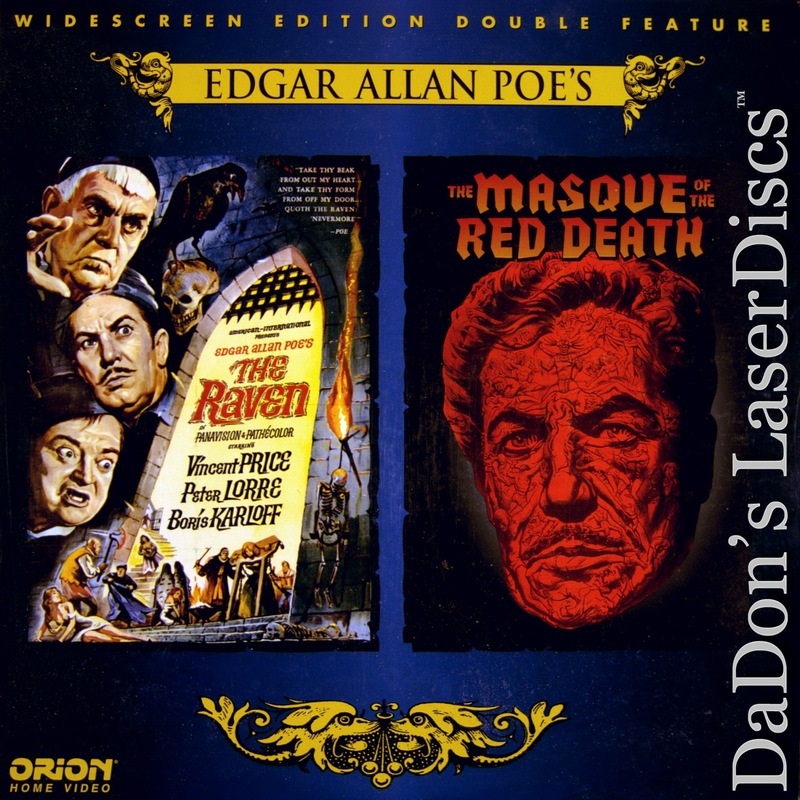 Hardly a gloomy tale of woe as the title might suggest, THE RAVEN is a hoot, with the chemistry of the leads providing maximum alchemical yield.